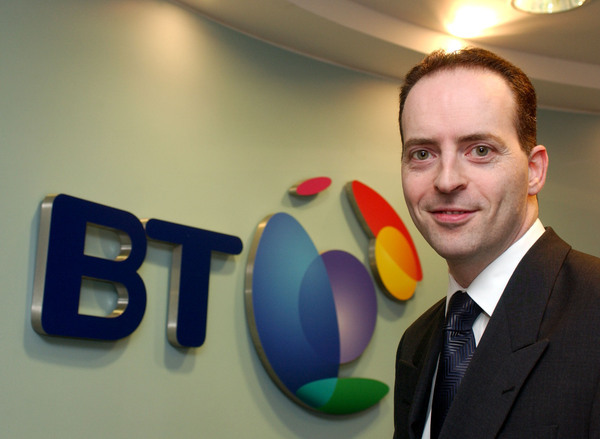 The time has come to consider whether CEO Ian Livingston’s cost-cutting at BT has now started cutting into bone. That he has been successful so far is without doubt. Livingston managed to pump £2bn into the pension fund just before year end, he’s been able to blow £786m for the rights to screen 38 football matches, the share price has doubled, and he’s raised the dividend from £388m in 2011 to £453m. He claims ‘superfast broadband’ now ‘passes’ 10 million homes. No doubt many shareholders feel he’s earned his £7m salary. At the sharp end, i.e. where people dig trenches, lay duct and hook up customers, things look different. The Surrey village of Ewhurst is no stranger to disappointment brought on by BT. For years it has tried to get high speed broadband into the village, so far with negligible results, thanks to BT. Villagers’ hopes lifted about a year ago when BT published plans to upgrade their street cabinets with fibre backhaul. Now it seems unlikely Ewhurst will see a next generation connection before September. There may be many explanations for the delays, but some are clearly of BT’s own making. Take this Reversed PCP 5352 cabinet, right outside the post office at Cranleigh, whose BT exchange serves Ewhurst. The housing has been put on back to front and cemented in. So the next time a lineman needs access to the frames, it will be all but impossible for him to get at them. Is this the only problem? No. In a videotaped council meeting Waverly councillor Diane James described progress in Ewhurst as “way behind schedule”. Ewhurst was meant to be finished in March, and now looks like missing the June deadline, she told fellow councillors. “The activities of BT and its agent are at best shambolic and incoherent,” she says. 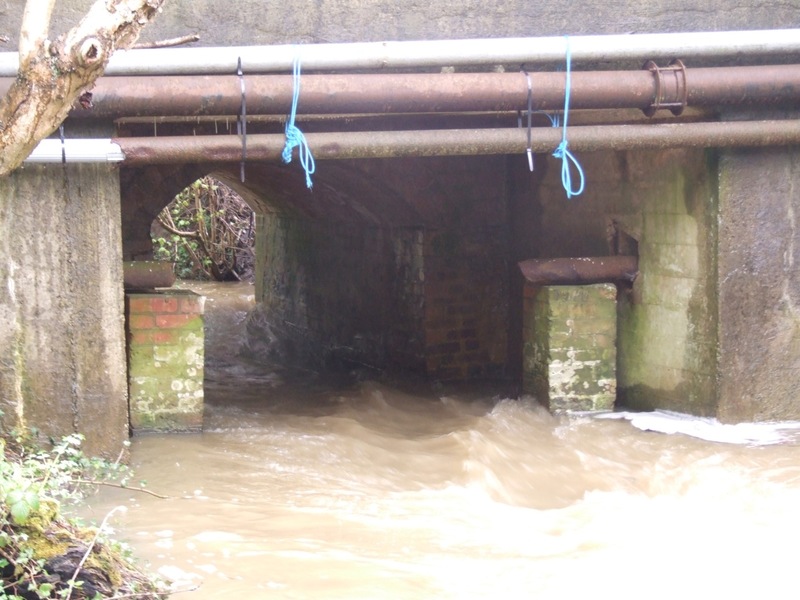 According to Walter Willcox, who also took the pictures, Ewhurst has “two cocked-up (street cabinet) planning applications, a set of damaged cables where the idiots rammed their drain rods, so potential damage (has) still to manifest itself, a re-sleeved PCP put on back to front, and now a long length of large ducts which also ought to be excavated entirely. Was this in the manual? That customer kept a log (BTInfinityfault log) of BT’s actions from when he ordered Infinity. It took BT six weeks and five engineers to install his service, which went live last weekend. Some will say that Ewhurst’s problems are what you’d expect for shooting your mouth off at a monopoly. That may be true, but that is neither acceptable nor the point here. 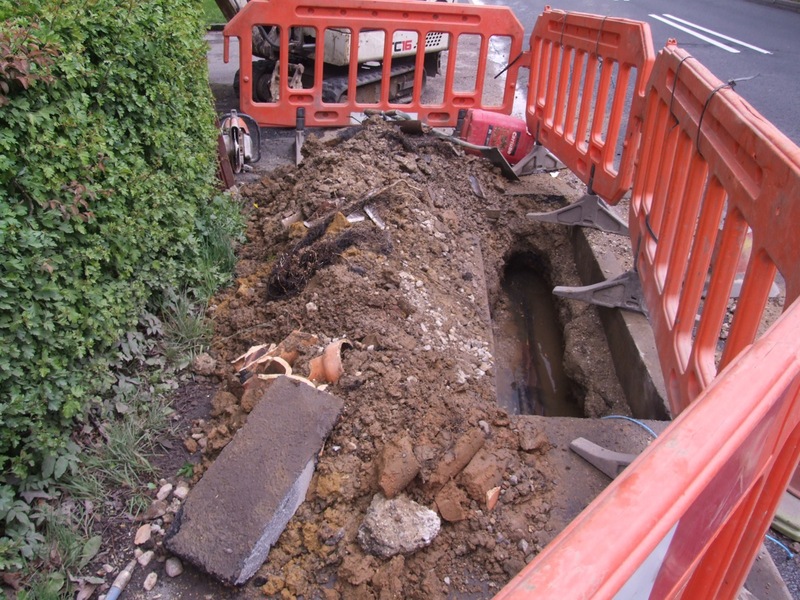 What should worry county councillors deeply is that they have to spend taxpayers’ money on next generation broadband procurement, but how much might have to go to fix up BT’s duct and pole infrastructure. Then there is money they might have to spend to repair shoddy or incompetent work, such as the resleeved cabinet in Cranleigh. The Ewhurst saga demonstrates a lack of professionalism, of historical jerry-rigging, and a willingness to do what is expedient. We must hope it is unique. After all, Sean Williams, BT’s director of strategy, assured the House of Lords communications committee ( videoat 17:08:13) that BT’s Infinity roll-out is a mass market, industrial-scale effort, and shouldn’t be disturbed. The hard evidence from Ewhurst is to the contrary. 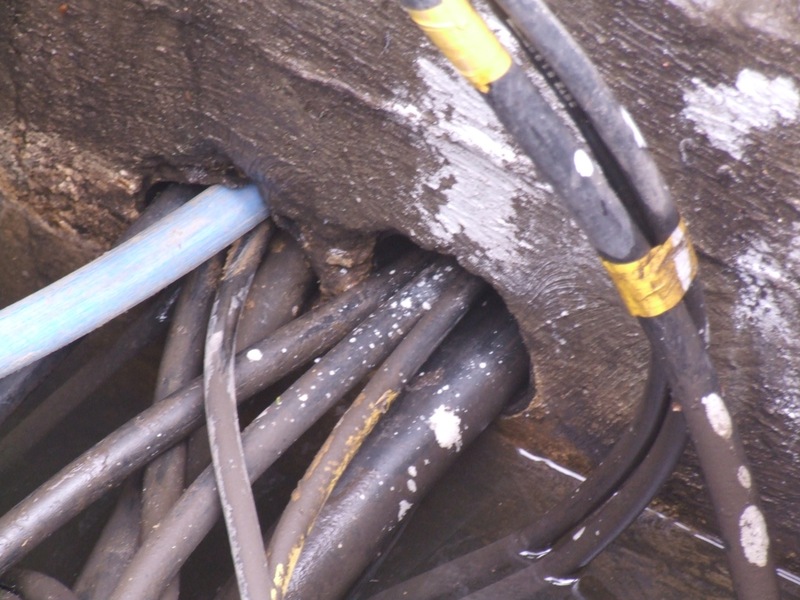 Broken pipework and tree roots suggest broken phone ducts. Water jetting to clear ducts, unless done carefully, can break the ducts. so the hundreds of thousands of users enjoying Infinity and more through other CP’s is clearly made up. In a huge construction programme like this to have a couple of issues looks pretty decent to me. Name a large. construction programme that hasn’t had snags. I remember when Videotron cause chaos in London when they built the CATV network. years ago. I think you are missing the point Neil. BT will pull out all the stops where there is competition, which is where the hundreds of thousands (out of 10 million homes passed) of Infinity users currently reside. Anyone living outside of the Virgin Media footprint may struggle the way Ewhurst does. Why the word ‘claims’, is there some doubt? Yes. The advertisement for a new top regulatory official for Openreach says BT has passed eight million homes. But hey, who’s countng when who counts is done and dusted? “the first installation near Notcutts went well and provided a capped downstream IP Profile of 38Mbps and an upstream one of 2Mbps over a distance to the FTTC (cabinet) of about 712m. (BT promises ‘up to’ 80Mbps downloads. )” – sound like they paid for a 2M / 40M service, which is cheaper than the 20M / 80M one and the 10M / 40M too in most cases. I think you are missing the point. Firstly BT is passed 10M homes – if those that we have passed want SFBB – they can have it. Yes all 10M of them. In BT’s results you can see we are ahead of target and will deliver many more millions of homes passed this year. Secondly BT needs to grow revenues and profit – and SFBB is one way to do this. Competition is vitally important. Even with competition there are parts of the country that investment for SFBB is not going to generate a return, however BT is working super hard to come up with ways to expand info regions were these challenges exist. I personally am working on some of these initiatives. Many of the technologies to do this don’t exist and it’s BT that’s driving suppliers and vendors to develop it – my question is if we don’t “trust” BT – who do we trust? Because few if any are really truly driving this technological agenda. Look outside of the UK – are there any silver bullets on rural connectivity? No. I personally have toured the world looking at what other providers are doing – from China to Japan to Germany and the US – none of these places have solved this problem. Community projects are great and may be the only answer but few communities have the know how and ultimately rely upon a few key individuals – but even when you look at these projects the true unit cost (when you include labour) of these deployment is typically uneconomical. What I’d like to see are real suggestions on how these issues can be overcome from you, what I hear is, well frankly, not a lot. Suggest this needs checking and article edited. i refer to the 20/80 or 10/40 figure that needs checking. BT is no saint, but then surely every large PLC will be looking after small things like dividend payments, and ensuring it reduces its debt. Imagine if BT had gone on a spending spree over NGN, and left pension pot at £9bn. What would have happened? As for Ewhurst, surely if there was money to be made why did none of the other telecoms firms jump at the chance? Thanks as always for your contribution Andrew. Regarding BT’s behaviour in Ewhurst, see https://br0kent3l3ph0n3.wordpress.com/2012/03/21/superslow-broadband-comes-to-surrey/and https://br0kent3l3ph0n3.wordpress.com/2012/01/04/how-bt-strangled-ewhursts-fttp-project-in-red-tape/ . Every company, indeed every shareholder, would like a monopoly. The reasons are obvious. But we live in a society that has determined that monopolies do not lead to the best allocation of resources. Russia and China both tried the centrally planned monopoly route, and we know where they ended up. I have never said BT should go on a spending spree in the rural areas. What I have said is that it should publish the precise street cabinets where it *does no*t intend to install fibre so that the residents can then make their own decisions about how they get high speed broadband services. In addition, that BT either develop and publish a standard interface that will allow third parties to connect to its network, or accept Ofcom’s Active Line Access interface. Further, if BT does not intend to install fibre in an area, it must let others do so at their own expense, using BT ducts and poles for free, or at least marginal cost. At present BT is squatting on assets paid for by taxpayers that were gifted it when it was privatised, and stopping people from doing what BT won’t. That might strike you as equitable; not me. ‘gifted’? I thought the shareholders paid for the assets nearly 30 years ago.